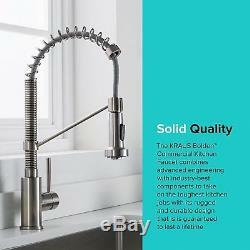 Kraus Bolden 18 Commercial Single Handle Kitchen Faucet w/ Pull Down Sprayhead. 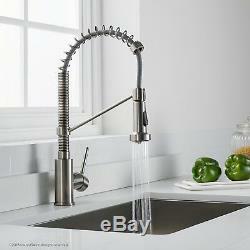 Professional style for the home featuring an industrial-style open spring spout with an ergonomic pull-down sprayhead. 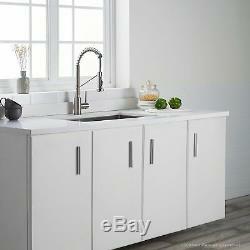 Optimized for residential use with a compact 18-inch height that fits underneath almost any kitchen cabinet. 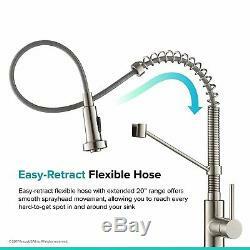 Combines the look of a professional faucet and the convenience of a smooth-retract nylon sprayer hose with extended 20-inch range. 2 spray modes allow you to go from aerated stream to powerful spray, covering everything from rinsing vegetables to heavy scrubbing. Heavy-duty lead-free brass construction and a best-in-industry ceramic cartridge provides a lifetime of drip free use. 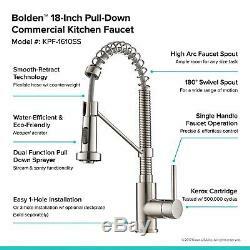 For a long-lasting kitchen faucet that enahnces your decor, install the KRAUS Bolden Commercial-Style Single-Handle Kitchen Faucet. This faucet is constructed out of lead-free brass with a superior rust-resistant finish to ensure a lifetime of happiness. A simple single handle design offers effortless control over water temperature and volume. Its pull down sprayhead features 2 modes that go from an aerated stream to a powerful spray, cleaning everything from rinsing vegetables to heavy scrubbing. 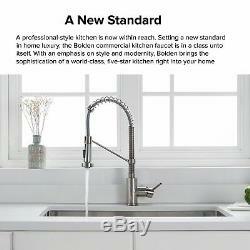 Because everyone knows that beautiful kitchens start with great design, look no further than the KRAUS Bolden Commercial-Style Single-Handle Kitchen Faucet. High arc spout offers ample height clearance for filling and cleaning large pots and pitchers. Corrosion and rust resistant finish surpasses industry durability standards, and will not fade over time. 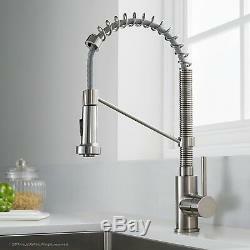 Faucet swivels 180 degrees for a broad range of motion in and around the sink. 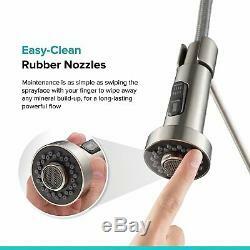 Soft silicone nozzles make maintenance as simple as removing limescale and mineral build-up with the swipe of a finger. 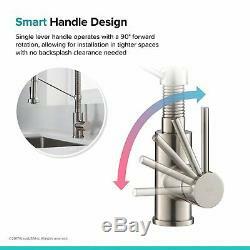 Faucet handle operates with a 90-degree forward rotation, allowing for installation in tighter spaces with no backsplash clearance needed. Simple and streamlined single handle design offers effortless and precise control of water temperature and volume. Water-saving aerator reduces waste without sacrificing pressure. 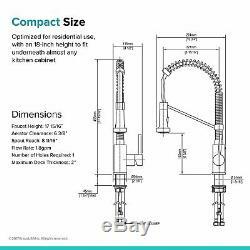 Faucet comes with pre-attached 22-inch waterlines and mounting hardware for easier installation. Spout reach: 8.69 inches. Spout height: 6.38 inches. Flow rate: 1.80 GPM. Max deck thickness: 1.75. Certifications: cUPC ASME A112.18.1/CSA B125.1, NSF/ANSI Standard 61 certified by IAPMO, NSF/ANSI Standard 372 certified by IAPMO, CAL GREEN, CEC, ADA, DOE, MASS Approved. Dimensions(L x W x H): 2.5 x 2.5 x 17.94 inches. Kraus USA revolutionizes conventional homes by manufacturing attainable, dynamic plumbing centerpieces & accessories that evoke the peace and luxury of European spas. Beyond the striking appearance of our products, Kraus applies a rigorous creative approach to our entire business process. From our elite group of Euro-centric designers to our handpicked components and state-of-the-art machining facility, we manage a highly efficient system to ensure endless value for our customers. With a passion for design and deep commitment to functionality and dependability, we work tirelessly to ensure that each Kraus product is finished flawlessly. Our warehouse facility also hosts our customer service center, allowing our support team to have accurate, on-demand information about products and inventory. With our mantra of â?? Kraus continues to transform interior spaces through striking design, and time-tested quality. Cancelling Your Order: Your order is important to us and will be processed immediately. Select the reason for the return. This listing is currently undergoing maintenance, we apologise for any inconvenience caused. 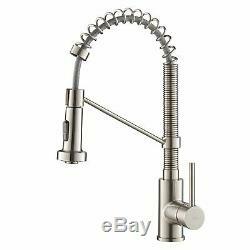 The item "Kraus Bolden 18 Commercial Single Handle Kitchen Faucet with Pull Down Sprayhead" is in sale since Friday, December 1, 2017. 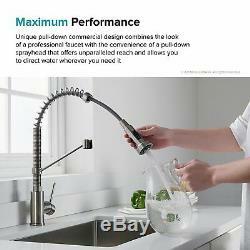 This item is in the category "Home & Garden\Home Improvement\Plumbing & Fixtures\Faucets". The seller is "vm-express" and is located in Lincoln, Nebraska. This item can be shipped to United States, Canada, United Kingdom, China, Mexico, Germany, Japan, Brazil, France, Australia, Denmark, Romania, Slovakia, Bulgaria, Czech republic, Finland, Hungary, Latvia, Lithuania, Malta, Estonia, Greece, Portugal, Cyprus, Slovenia, Sweden, South Korea, Indonesia, Taiwan, South africa, Thailand, Belgium, Hong Kong, Ireland, Netherlands, Poland, Spain, Italy, Austria, Bahamas, Israel, New Zealand, Philippines, Singapore, Switzerland, Norway, Saudi arabia, Ukraine, United arab emirates, Qatar, Kuwait, Bahrain, Croatia, Malaysia, Chile, Colombia, Costa rica, Dominican republic, Panama, Trinidad and tobago, Guatemala, El salvador, Honduras, Jamaica, Antigua and barbuda, Aruba, Belize, Dominica, Grenada, Saint kitts and nevis, Saint lucia, Montserrat, Turks and caicos islands, Barbados, Bermuda, Brunei darussalam, Bolivia, Ecuador, Egypt, Guadeloupe, Iceland, Jordan, Cayman islands, Sri lanka, Luxembourg, Macao, Maldives, Nicaragua, Oman, Peru, Pakistan, Paraguay, Viet nam, Uruguay.